GREENFIELD, Wis. - A dog stolen from the backyard of a Milwaukee home, burned over most of her body and then left in the cold received a skin graft surgery on Monday involving pigskin - a procedure usually done only in humans. 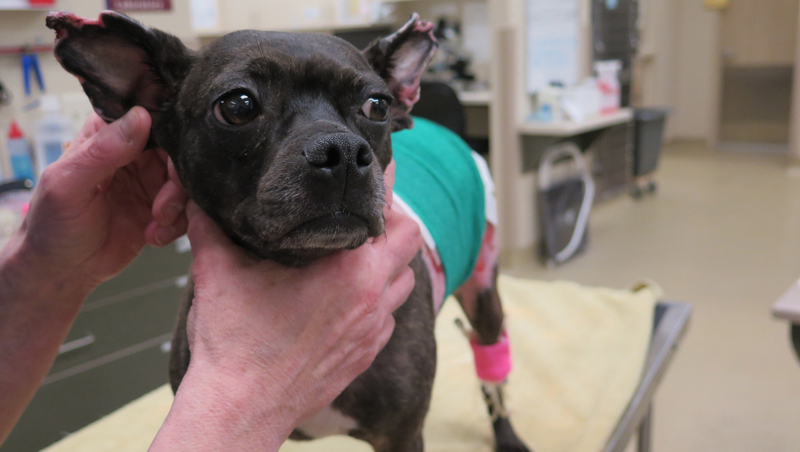 The 5-year-old black Chihuahua mix, named Beatrice, was snatched March 13 and found 11 days later outside a casino with burns over 90 percent of her body. Her whiskers and eyebrows were also singed. The hourlong surgery performed Monday involved putting pigskin over the dog's burns to let them heal. It will eventually come off. The foot-long piece of pigskin was donated, as was the time of Dr. Marla Lichtenberger, a veterinarian, and Dr. John Weigelt, a surgeon from Froedtert Memorial Lutheran Hospital and the Medical College of Wisconsin. Lichtenberger estimated it would have cost around $4,000 if the services and skin weren't donated, on top of the owner's estimated $5,000 in vet bills. Lichtenberger, of Milwaukee Emergency Center for Animals in Greenfield, said people wanted to help because they were moved by the dog's story. "Everyone has this sense of love for something that just isn't fighting back and has no fight back and has no say because they can't talk, they can't get away, they can't do anything," Lichtenberger said after the surgery. She has never used pigskin before for burns and said she has been unable to find any reports of anything similar on dogs. Earlier this month, Milwaukee police said they had identified a 21-year-old man they think is responsible for burning Beatrice. He's being held in the Waukesha County jail on unrelated charges. The Milwaukee County district attorney is still considering charges. Beatrice's owner, Karen Burns, 61, said she had let Beatrice and her two miniature Doberman pinchers out March 13, but had called one back. While tending to that dog in the house, she heard Beatrice bark twice and her other dog "go crazy." She looked out and Beatrice was gone. Beatrice will need wound care and additional skin grafts to heal completely, Weigelt said in a statement. The idea of the pigskin came up after Lichtenberger asked a friend at Froedtert for advice "out of sheer frustration that her skin wasn't healing," she said. Only about 40 percent of the burn skin had healed. Burns was hopeful the surgery would help. "She is not completely defeated by this," Burns said. "She's still got a good spirit." Even so, she hasn't been acting normally at home, Burns said, and at least one of her other dogs seems to know Beatrice needs extra care. "The male of the two has been giving her licks and he has been cleaning her ears for her," she said. Animal Fairy Charities is raising money to help with Beatrice's medical bills.